On the back of your closet, use decorative wall hooks from home improvement stores and stick them up. It makes a perfect place to store your necklaces without thinking about them tangling with each other. If you love a rustic look, this one’s for you. The next time you go for a swim on the beach, look out for driftwood. Since it’s dried by nature, you’ll might even be able screw some hooks on them without using any tools. Then hang the piece of driftwood with hooks on the wall, and voila! Be creative and make a dream catcher, use some twine and play with it until you have your desired look. Your earrings can be hanged on the strings of the dreamcatcher. In the middle of your wooden plank draw a line that’ll act as your guide where to place the animals. Cut the plastic animals in the middle with your hand saw or knife. Add glue to the halved plastic animals and press them firmly against your drawn guide. Hang it somewhere safe and spray some paint on the plank and toys. Let it dry when done. Most of us have unused, small decorative vases or glasses stored away. Instead of keeping them hidden away, you can repurpose them by making them a place to stack your bracelets and bangles—like your custom made name bracelet and bangle from Getnamenecklace. Start by painting its old frame with any color of your choice. Get some extra decorative fabric and cut to fit the board. Glue the fabric to the corkboard. Get some pearl-headed push pins and pin it to your cork board jewelry display. Hang your earrings and necklaces! Get yourself a picture frame, either old or new ones are fine. Remove the glass and backing from the frame. Cut a piece of wire and size it with your frame. Use a staple gun to secure the wire behind the frame. Display your jewelry along the wire. 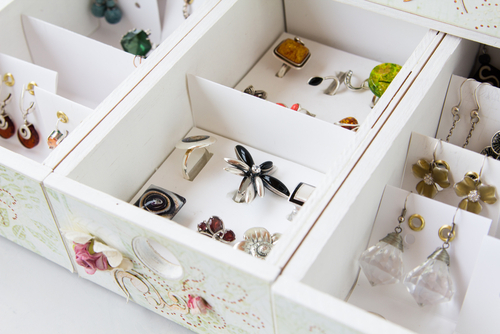 Hopefully, these ideas help you cleverly store your jewelry, while keeping it clean and organized to prolong quality and brilliance.